Your Brown and Sharpe spindle is in expert hands with the factory-trained technicians at High Speed Technologies, Inc. We have repaired dozens of Brown and Sharpe spindles to original factory performance. Need it fast? 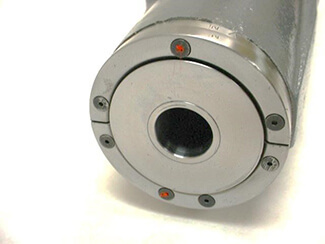 We can repair your spindle within three days of approval. 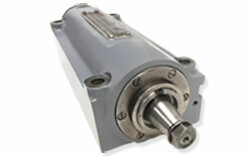 All spindle repairs are backed by a complete warranty and our 30-year reputation of OEM-quality spindle repair. The first Brown and Sharpe ID Grinding spindle we’ll speak about below came in nearly already out of the box. The customer, a precision machine shop out of Arkansas, sent the spindle in because it was getting “noticeably hot” when running at higher RPM. Upon disassembly we observed evidence of excessive heat at the work end of the spindle. This is typical for this style of grinding spindle. After dismantling the spindle further and examining the #1 bearing, we could see why the spindle was getting hot at a higher RPM. Over time the grease lubrication had become contaminated with grinding particulate and had lost its ability to keep the bearing lubricated and cool. In turn the bearing got increasingly hot until the customer finally noticed it. Fortunately, the customer pulled the spindle before it seized and caused more damage than was already done. We replaced the front bearing with a sealed version to provide and extra barrier of protection against grinding particulate in the future. The rear bearings were replaced in kind. There was also some damage to the shafts rear bearing shoulder which we were able to eliminate with a Kiss grind on our universal grinder. After squaring the shoulder and inspecting it, we assembled the spindle, verified runout at the tapers and test ran the spindle for nearly two days. This may seem like a long time to test run a spindle, but we do this with some spindles for several reasons. The foremost reason is to break in the bearing grease, so the customer does not have to. For all intents and purposes, the spindle is ready for installation and operation as soon as the customer plugs it back into the machine. After close monitoring, the bearings broke heat and we were ready for the final run-testing at 12,500 RPM. The spindle ran wonderful! Balance and alignment numbers were well within specification. And the spindle, which failed due to overheating, did not get any warmer than 85°F running at max RPM for over 4 hours. Seeing as the bearing and bearing lubrication is rated over 250°F, we could actually say this spindle ran very cool! With a fresh coat of paint, the spindle cleaned up well. This Brown and Sharpe spindle ran and looked like new once again! It’s been in the customer’s machine grinding precision surfaces for over 5 years now and still going strong! Runout at the taper ID measured within specification! With a fresh coat of paint this Brown and Sharpe looked… well, sharp! 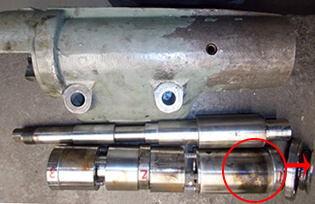 The second Brown and Sharpe spindle we’ll be addressing had one of the most common types of spindle failure we see, worn or contaminated bearings. This too was the main cause of failure with the below Brown and Sharpe spindle. 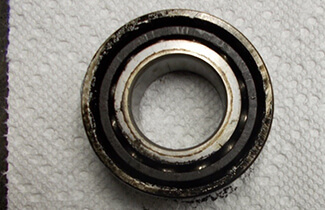 Upon receipt and disassembly, all of the bearings were found to be operable but well-worn and slightly contaminated. 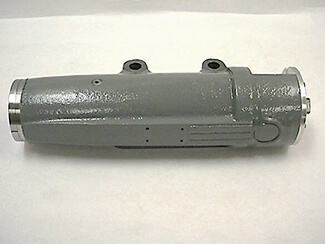 This came as no surprise considering the spindles age, but each bearing was worn to the point where it was negatively impacting its surface finish. Nothing our standard repair and a new set of bearings could not correct. Here at High Speed Technologies we love a happy customer! For expert Brown and Sharpe spindle repair, please email or call us at 603-483-0333 for a free, no obligation quote. We offer one-year warranty and Quick-Turn-Around. We are fast, experienced and our work is guaranteed! !